The Highland Council has awarded a contract to a world leading engineering design firm to carry out comprehensive flood protection studies for two Highland coastal towns. Thurso on the north coast and Golspie on the east coast have both suffered from flooding incidents over the years that has affected domestic and business properties and resulted in both towns being identified as Potentially Vulnerable Areas (PVAs) in the Highland and Argyll Local Flood Risk Management Plan. In Thurso a tidal surge during a winter storm in January 2005 combined with a high river level resulted in the river's flood defences being breached and widespread flooding occurring within the town centre. 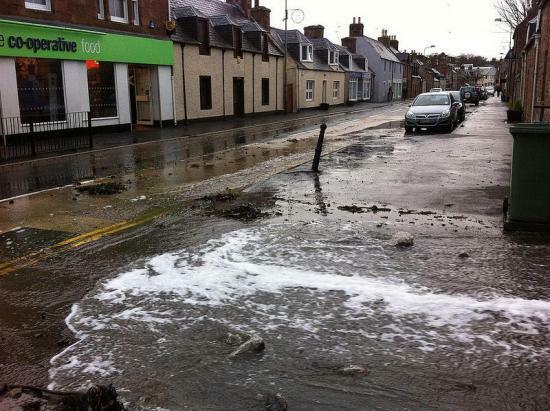 In Golspie the sea wall that runs along the front to protect the town is often overtopped by waves during high tides when combined with storm events resulting in flooding of properties along the front and into the town centre. The Highland Council has commissioned AECOM to carry out in-depth flood protection studies of the two affected towns that will involve producing detailed hydraulic models to better understand the combination of tidal and river levels during storm events and how these result in flooding within the respective study areas. The results from these models will enable the Council to assess the most sustainable solution to effectively mitigate the flood risk in each area for the mid to long-term. Each flood protection study will, by the spring of 2019, have developed outline designs for public consultation and Council approval.